Finally a product that addresses the major issue of unhygienic toilet seats in public places. This auto-seat cover changer provides a fresh wrap-around clean seat cover before every use at the press of a button. Ideal for multiple users, especially ladies in public places like offices, schools, airports, hospitals, restaurants, shopping malls etc. please share your requirements for Mahindra NST Foam Seat Cover. 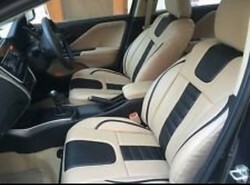 We are one of the reputed manufacturers and suppliers of a wide range of Comfort PU Leather Designer Seat Cover. These seat covers are offered in classic designs and patterns and are demanded extensively in different parts of the country.